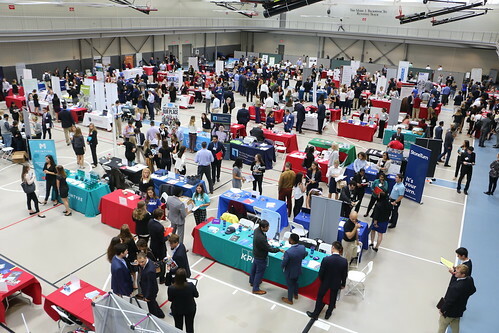 Fairfield University’s Academic & Career Development Center hosted its annual Fall Career and Internship Fair with 745 students and 123 employers in attendance. It's not surprising that Fairfield has risen to #1 Best Regional University in the North in the annual U.S. News & World Report Best Colleges 2019 ranking when you see the excitement at the University's annual Career, Internship & Non-profit Fair. The Fair is an opportunity for students to network and interact with potential employers, and this year was Fairfield’s most broad selection of organizations across majors. Some of the organizations in attendance included Epsilon, Ernst & Young, Fairfield University Graduate Admission, HooplaHa, Indeed.com, KPMG, Morgan Stanley, Prosek Partners, PwC, Insight Global, Save the Children, and Synchrony. It’s never too early to start thinking about Fairfield’s Job Shadow program. During winter break, the Academic & Career Development Center pairs students with alumni professionals for a day or half-day of rewarding career exploration. Through this opportunity, alumni can have a powerful influence on mentoring a Fairfield junior or senior. Learn more or sign-up at fairfield.edu/jobshadow.